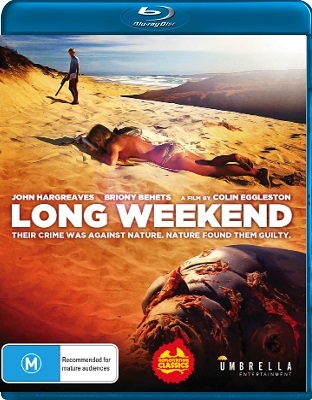 Long Weekend is an Australian horror movie directed by Lawrence Colin Eggleston and starring John Hargreaves and Briony Behets. Hargreaves and Behets play Peter and Marcia. Their marriage is in difficulty and Peter decides he and Marcia need some time alone together. He sets his heart on a long weekend camping at a deserted beach, in the middle of nowhere. Marcia is not keen on the idea but she goes along anyway. The couple don’t talk a lot on their journey to the beach. The atmosphere inside their Land Rover is strained and it is obvious that they are not the happiest of campers. Neither are they the most responsible and they manage to cause a certain amount of havoc without even leaving their vehicle. First of all, Peter throws a lighted cigarette out of the window as he drives away and it ignites the grass at the side of the road. Then a few minutes later he is so busy fiddling with his next smoke he mows down a kangaroo. The trip seems doomed from the start. Peter is unable to find the beach and ends up driving around in circles in the dark and in a lot of hot water with his wife. When Peter stops the vehicle Marcia is keen to leave the bush and find a hotel, but Peter insists they sleep in the Land Rover. Peter is the first to wake up and by the time Marcia clambers from the Land Rover he has got breakfast underway. Better still, he has discovered that the beach is just over the hill and he has already set up camp. He appears to be quite a capable camper, but is obsessed with boy-toys like his brand new rifle and his harpoon gun. For some strange reason, his axe is not without its attractions either and when Marcia asks him why he is chopping down a tree his only reason is “Why not?” Actions like this, along with his litter-bug ways, give an indication of how little respect he has for the environment. The stretch of coast that Peter has brought them to is breathtaking and, for a while, it looks like all that sun is and sand is beginning to melt the ice between the couple. The thaw is a short one and, as everything goes wrong for them, their relationship begins falling apart faster than ever. One of their first problems is just a little one. Lots of little ones actually—ants—and Marcia murders the little blighters with a can of insecticide. Then the frozen chicken spoils at an impossible speed and when Peter takes it out of their portable freezer he finds it’s covered in mould. This is very strange, but not unduly alarming. On more than one occasion, however, Peter is attacked by the local wildlife and is particularly shaken after an encounter with an eagle. Through all of this Marcia is quick to remind her husband how bored she is and that she wants to leave. Peter is not for budging though, even if their long weekend has become more of a wrong weekend that is destroying more bridges than it is mending. Hargreaves and Behets are very well cast as the warring Peter and Marcia, who sometimes seem to love each, but at other times only appear to need each other because they have nobody else. They paint a very believable picture of a complicated relationship that is falling apart. Long Weekend is an extremely good movie and the idea of nature striking back at humanity is quite a scary one that is handled very well here under the direction of Colin Eggleston. Long Weekend is also an often underrated movie that is rarely aired in the UK. Because of this many people have never even heard of it and it is often hard to find it on DVD or Blu-ray. So if you do see a copy you’d better snap it up fast.